7th CPC - Dress Allowance for eligible Railway Employees (RBE 141/2017), GOVERNMENT OF INDIA (BHARAT SARKAR), Ministry of Railways (Rail Mantralaya), (Railway Board), PC-VII No.- 64, RBE No. 141/2017, File No. PC-VII/2017/I/7/5/7, New Delhi, Dated: 03.10.2017, The General Managers/ CAOs(R), All Indian Railways and Production Units, (As per mailing list), Subject: Implementation of the recommendations of the Seventh Central Pay Commission - Dress Allowance. 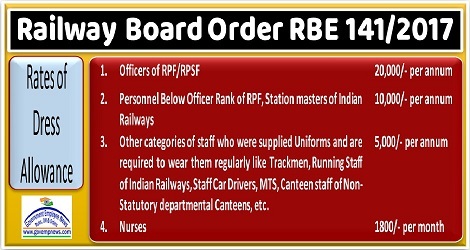 In terms of extant instructions, the Uniform- related allowances being paid to Railway employees as admissible included Kit Maintenance Allowance, Shoe Allowance, Uniform Allowance and Washing Allowance. Subject: Implementation of the recommendations of the Seventh Central Pay Commission - Dress Allowance.